Dave Kellett draws Richard Thompson receiving the Rueben while Jef Mallett sneaks Dill into Frazz. Richard Thompson won the National Cartoonist Society's Reuben Award, named after legendary cartoonist Rube Goldberg, in Boston last night. 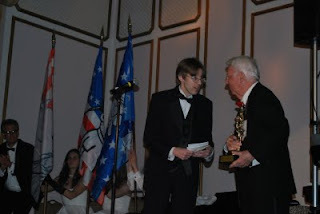 Comic Riffs has the story and also points out that Gary Varvel who won the RFK Journalism Award for editorial cartooning here in DC, also won the NCS editorial cartooning division award. Here are a few quick photos of Richard's wonderful evening, taken by Chris Sparks. Congrats ! Richard Thompson and Chris Sparks. Jay submitted this wonderful TCDS art for us. I can never say thank you enough to everyone who has helped us but I will try! Jay I think you have done a wonderful job in capturing the CDS kids in your style. It is awesome! Thank you again! Read below in what Jay had to say! I'm a big fan of Richard Thompson's comic strip, "Cul De Sac", and also a big fan of Harper Lee's book (and the movie based on it), "To Kill A Mockingbird". When I first read Richard's comic, I was overwhelmed by the wonderful similarities of the two works, from characters to themes. Most noticeable for me were the shared ideals of hope and perseverance. With these tools, we can get past preconceived notions about folks in our community, or we can manage a public obo solo (without the aid of a security cape and Viking helmet) despite our fear of being stared at. Richard goes further to carry these strengths into his personal life, which not only inspires me as a cartoonist, but as a person. Though I typically draw in pen and ink and color my work digitally, for this piece, I tried to suggest Richard's style by coloring with watercolor pencils. Hopefully I managed an faithful connection to Cul De Sac by employing this fun and challenging medium. I meet Chris last year at Heroescons. 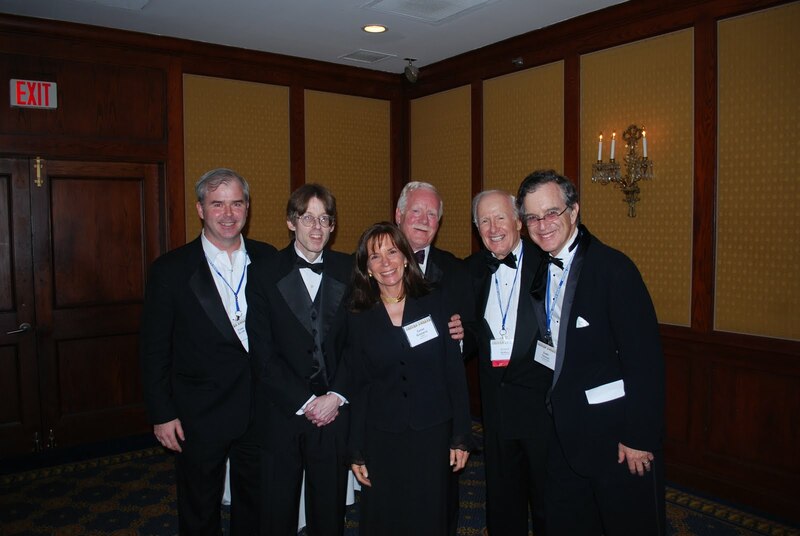 Not only did Chris,Shannon,Craig,Mike,Richard and I all have dinner together I got a chance to buy two books in the The Crogan Aventures series. Folks, these are a must read at any age! Chris is a big fan of Richards and I hope you check out http://curiousoldlibrary.blogspot.com . Chris, see you in about a week! Thank you for being such a big supporter of TCDS. Here is a note from Chris about Cul de Sac and a little bio on him. 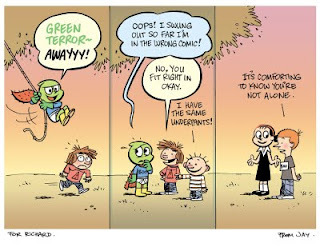 Cul de Sac is, of course, the best drawn and funniest strip to come along since Calvin and Hobbes, and is one of the best ever made, which naturally earns Richard my respect. His handling of Alice, Dill, and Petey, however, has earned him my jaw-on-the-floor awe. I genuinely believe that Richard understands children better than any writer - and not just of comics - that has come before him. I know that this is a grandiose statement, and I do not say it lightly. Most of us cartoonists are kids at heart, and hopefully have a little insight, but Richard so deftly presents the logic of the little that it makes the rest of us look like gripey old curmudgeons. For that, and for the hours of joy that come from reading his strip and sharing it with my family and friends, I offer him my sincerest thanks. Chris Schweizer is the author of The Crogan Aventures, a graphic novel series that chronicles the exploits of the fictitious Crogan family line at different points throughout history. He lives in Marietta, GA with his wife and daughter, and teaches comics at SCAD-Atlanta. Craig Fischer here. As I wrote in a previous post, I'm putting together a zine to sell in order to raise money for the Team. The zine, called Favorites, consists of essays written by comics critics, artists and bloggers about their most cherished comic strips, comic books and graphic novels. I'm happy to report that the zine is on schedule to premiere at Heroes Con in Charlotte, NC, coming up on June 3-5. Favorites will cost 5 dollars, and every cent of each sale will go towards research for a cure for Parkinson's disease. After Heroes, we'll make the zine available through the mail. So stop by the Team table at Heroes, say hello, spend five bucks on our zine, and help us battle Parkinson's. See you then! I got this note from Raymond's Mom,Sandy about his love of Cul de Sac. What a great watercolor painting! Thanks Raymond! 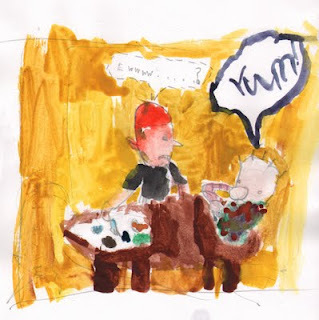 My 8 year-old son Raymond is a huge CDS fan and wanted me to pass along his watercolor of Petey and Dill eating together. Petey's food is in separate little piles, Dill's is all mixed up and Petey is disgusted. Brian Basset did this beautiful art for us. WOW! Thank you sir. I think Petey needs a dog! Don't you? Jonathan sent this awesome piece and share his thoughts on Richard and himself. This guy is such a class act. I am so glad he wanted to contribute to TCDS! Here is his little story about his love for Richard and Cul de Sac. I started reading Cul de Sac when it first launched on GoComics in 2007 and I, like millions of other readers, have been a big fan ever since. When the call went out for contributions to Team Cul de Sac I knew it was a great opportunity to support someone who had given me many laughs over the years. Having suffered some permanent nerve damage that left my drawing hand partially paralyzed, I have some limited insight into what it's like when your wiring doesn't quite function properly. Drawing a simple circle can suddenly become extremely frustrating. I also know that, while I was working through therapy and coping with this new reality, comics were a powerful source for that healing, both physically and mentally. 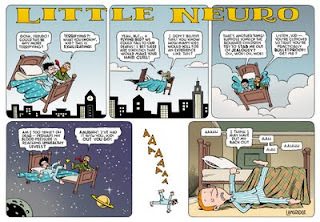 For that reason, I think comics provide an excellent and unique way to promote awareness and raise funds for Parkinson's research. I am very pleased to play a role and support Richard's Team Cul de Sac. Here are the links to check out. 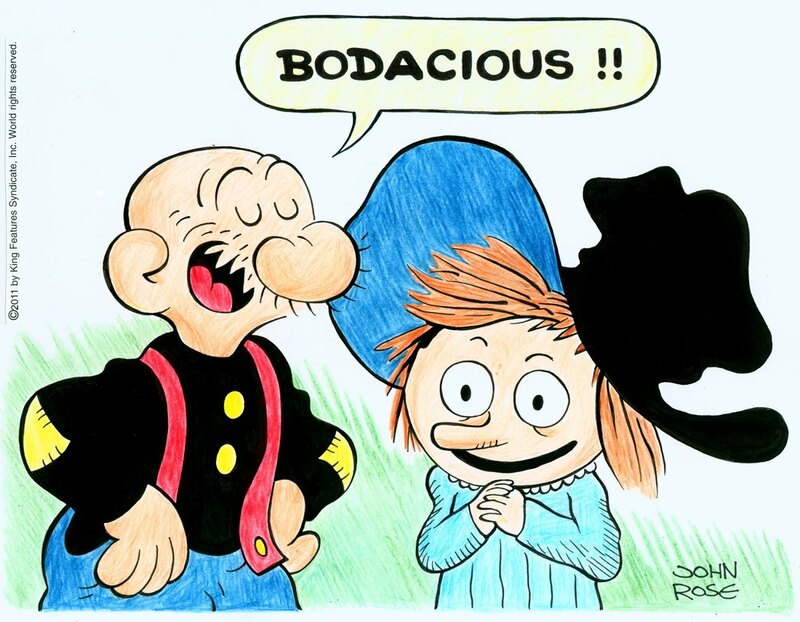 I was hoping to find out more dirt on this beloved cartoonist but there is nothing but praise from folks like Art Spiegelman, Mike Peters, Stephan Pastis, Pat Oliphant, Nick Galifianakis and Bill Watterson. 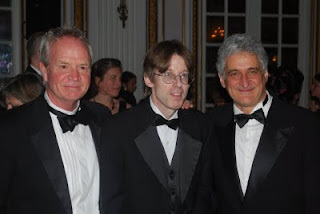 Adrian met Richard at last year's Reuben awards and wanted contribute to TCDS. Adrian is the Chapter Chair for the Berndt Toast Gang/Long Island Chapter of the NCS and am also a member of the Society of Illustrators. 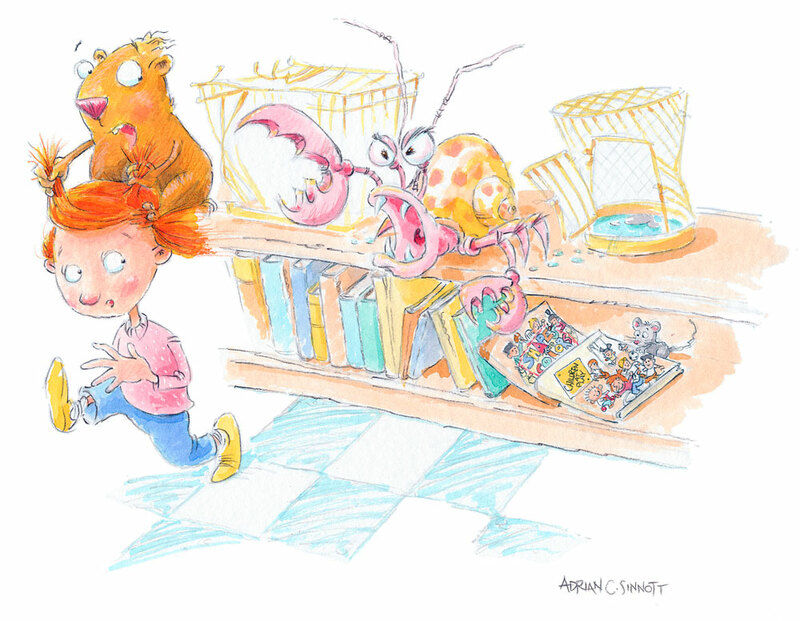 I do children's books, advertising illustration. I love this piece of art. A big thanks to Costa for contributing to TCDS with some art but Costa is also in our Fanzine that will be making its debut in two weeks from today at Heroescon in Charlotte NC. Thank you so much for all you do Costa. Please go to http://costak.wordpress.com/ to learn more about the incredible CK! 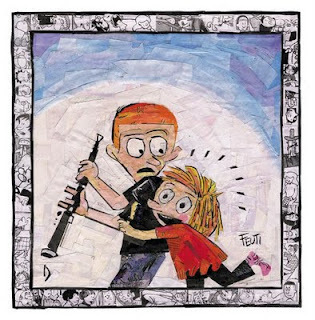 "Cul de Sac" creator RICHARD THOMPSON, as the cartoonist discusses his professional and personal journey, the state of the comics industry, life with Parkinson's disease -- and the birth and growth of Team Cul de Sac. Thats all I know folks. Sounds like some good reading! 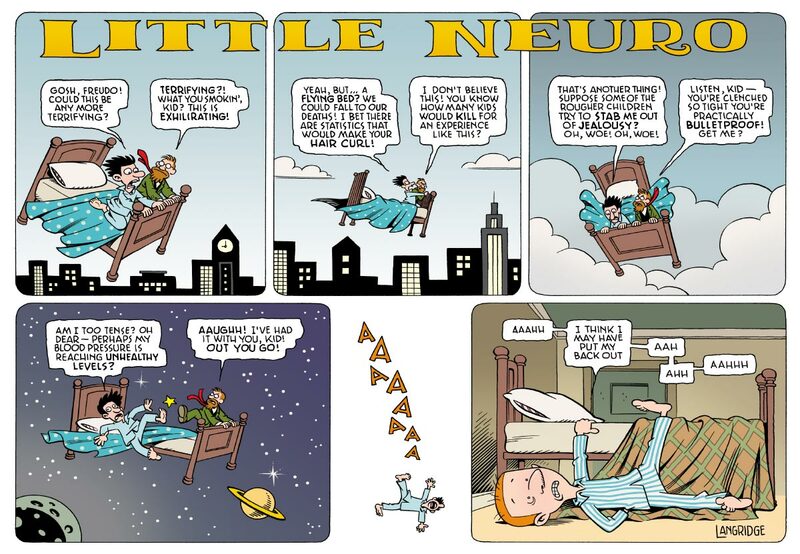 awarded the incredible prize of a 1-month mentorship with Rick Kirkman, co-creator of the very popular “Baby Blues” comic strip! Good luck Daniel it is only a matter of time till we see you syndicated! 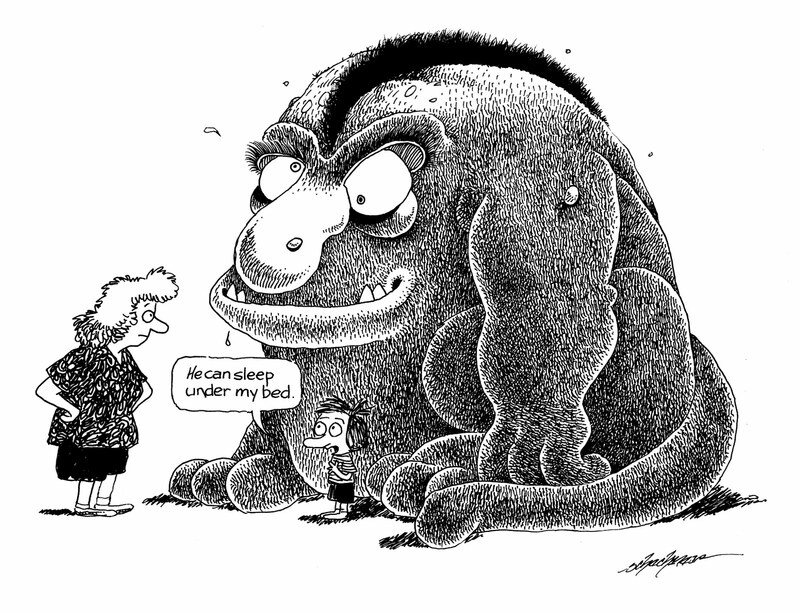 “Richard Thompson was one of the judges in the Washington Post’s “Americas Next Great Cartoonist” contest. I was a finalist in the contest, and Richard wrote some encouraging feedback to me. It was because of encouragement like his that I decided to keep going with my strip. A few months later, I got the opportunity to meet Richard at the Baltimore Comic Con. Richard spoke with me for what seemed like an hour, and endured all of my endless questions with a smile. Richard Thompson is one of the Good Guys, and his Cul de Sac a bright spot in the comics pages. Thank you, Richard! So today was the official unofficial deadline for art. As noted in an earlier post, we will be extending it until Fathers Day Weekend. Why? 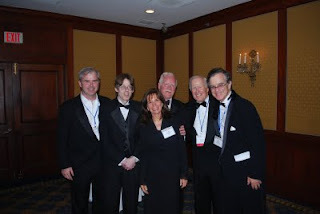 Well, first I am going to the Reubens to find more contributers and meet the the find folks of Andrews McMeel Publishing. Oh yeah, I am also going to be sending Mr. Thompson good vibes that weekend. 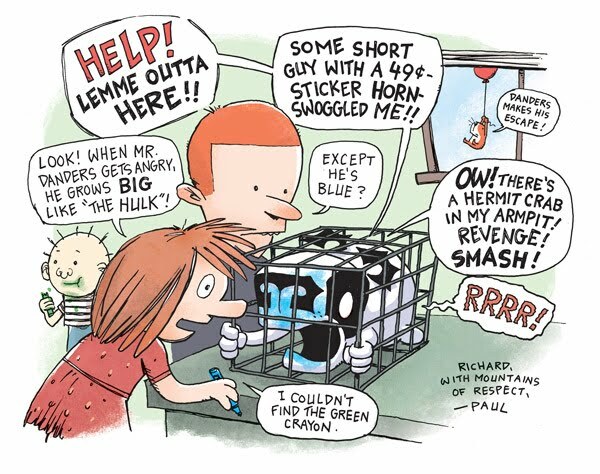 Richard is up for cartoonist of the year! 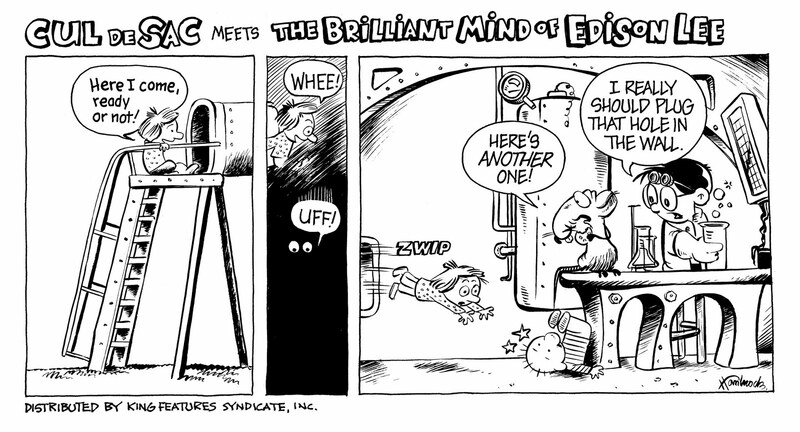 Cul de Sac is up for the division award for newspaper strip of the year! The following weekend Mr. Thompson will be making debut at Heroescon in Charlotte NC. OK, it will be his third time but who is counting! 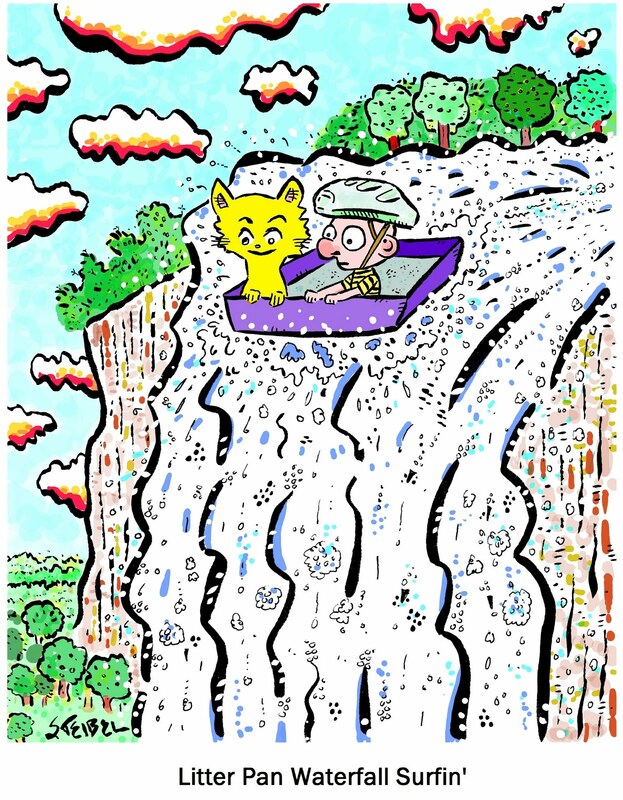 The Team Cul de Sac Fanzine will be making its debut at the show! A true collectors item and folks it will a grand ol time. More details on the Heroescon soon! I can never thank Mike and Craig for all the help they do for Team Cul de Sac. So now to catch up. Ms. Piro is the Queen and KingFeatures and we are lucky to have her on our team. Here is a little about her. Ms. Piro submitted her art a few weeks ago.. I am behind on my deadlines! Jason had so much fun.. he sent us another cool submission. I have worked for some small local publications in the past. I'm a part-time freelance illustrator and cartoonist from Burlington, Vermont. 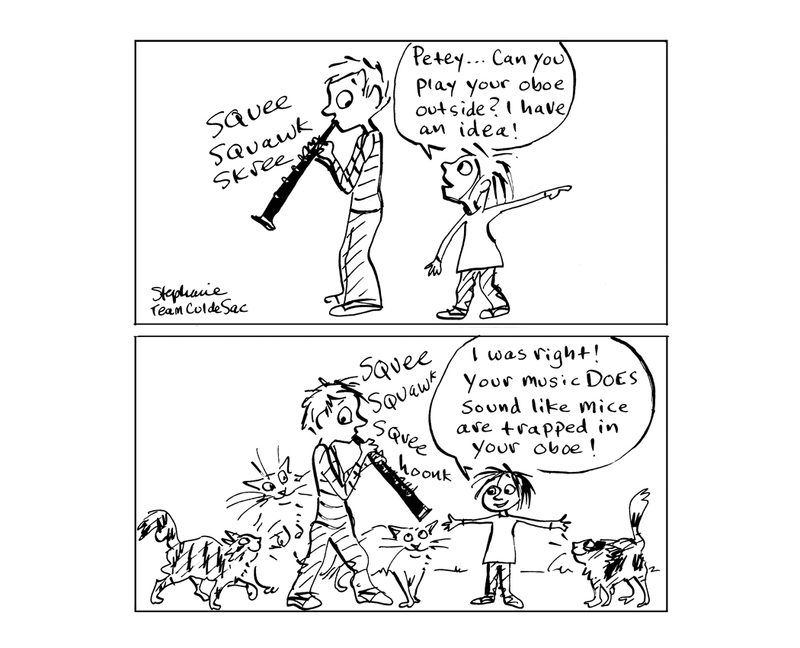 I currently publish two web cartoons. Both of which are single panel gag cartoons. One for the Life With Dogs website (Fudge & Friends). This website is one of the top three dog related websites in the world. It gets tens of thousands of unique views each week and has several hundred thousand regular followers. This is why I chose my Fudge & Friends cartoon for your project (exposure for your auction and book). 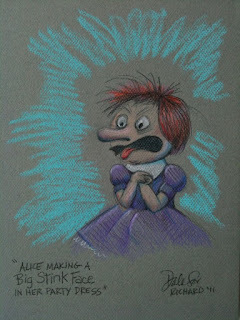 Sneak at Stephan Pastis drawing Alice. 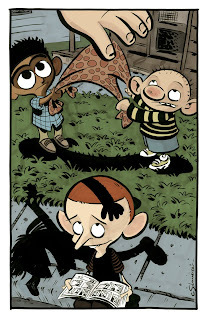 Stephan is the first person that I asked to do art for Team Cul de Sac. He said YES and he would help in anyway he could. So, Stephan will be running this Pearls Before Swine strip sometime this summer in support of Team Cul de Sac! I am sure this will be a Gem in the auction. 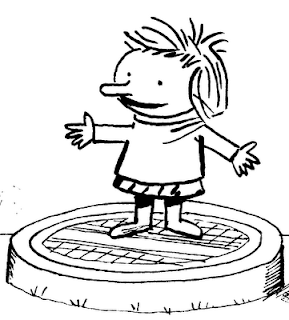 I hear that originals strips are almost impossible to come by. Bid often and bid a lot of gold on this one! 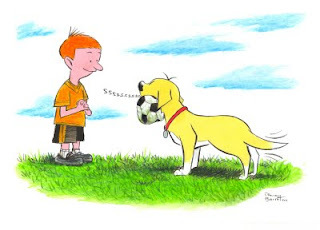 Growing up,I loved Snuffy Smith. Snuffy was like most of my relatives in the mountains of Western North Carolina! 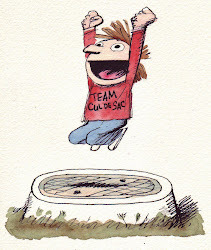 So it was such a thrill when John rose wanted to donate art to Team cul de Sac. I am hoping Richard can incorporate the hat in future Cul de Sac Strips. 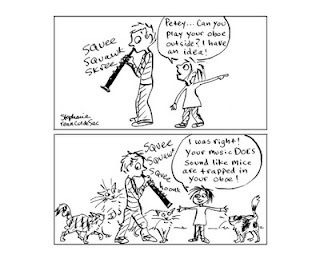 strip has been the greatest joy of John Rose's professional career. his editorial cartoons are distributed by the Scripps Howard News Service. Cartoons of the Year collections (Pelican Publishing) each year since 1994.
feature has spawned three activity books: Fun With Pup!, More Fun With Pup! writer and inker for Archie Comic Publications. Karen and daughters, Meredith and Sarah in Harrisonburg, Virginia. Norm sent us “Alice’s Song” to blow everyone away. Norm this is just so creative and beautiful. Thank you so much! Look at the border folks! "I wanted to create an homage to Richard’s characters out of the very media he enriches every day with his brilliant comic strip. The piece is entitled “Alice’s Song” and was inspired by the final panel of a strip from the first Cul De Sac book." 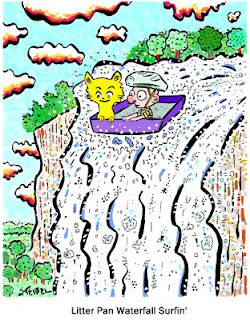 Norm Feuti is a syndicated cartoonist, author, and freelance artist living in Plainville, Massachusetts. 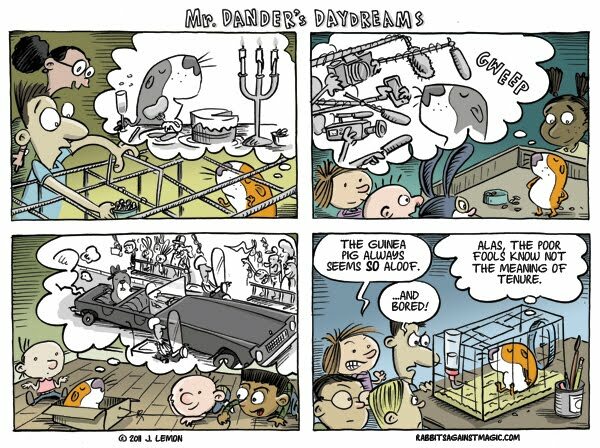 Norm’s syndicated comic strip, Retail, presents a humorous look at the retail industry by chronicling the daily events at the fictitious Grumbel’s department store. 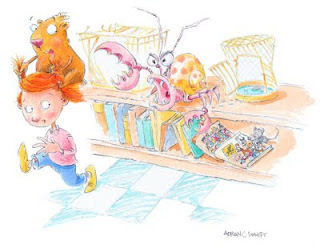 Drawing from his 15 years of experience working in retail management, the humor of Retail plays out through the day-to-day trials and triumphs of four main Grumbel’s department store employees (Marla, Cooper, Val, and Stuart) and the customers they encounter. Retail is distributed worldwide by King Features. 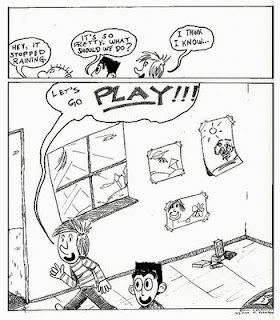 Retail can also be read daily on www.retailcomic.com. Phil ,Bill LaRocque and I all live in Asheville North Carolina. I met both guys at the monthly cartooning meeting last year. Bill has been friends with Richards for a billion years. Phil is an admirer of Richards and wanted to contribute to Team Cul de Sac. I just stalk Richard. Phil will be attending the Reubens in a few weeks and will be my roommate. I am very lucky to have met Phil and I think he is going to be a big star one day. Years from now I can tell everyone I spent the night with Phil... back in the day. Please check out his work http://bestinshowcomic.com/wordpress/. Thanks buddy! See you in a few weeks! Now a few words about Phil. Phil Juliano is a cartoonist and member of the Southeast Chapter of the National Cartoonist Society. 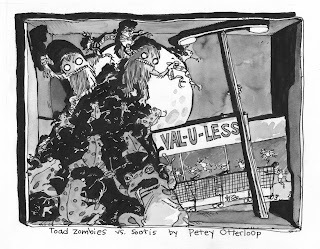 He draws cartoons for twelve independent newspapers, magazines and web sites around the east coast and mid west. His comic strip, Best In Show, reflects his place in modern society...beer snob, coffee addict, baseball fan, victim of technology...He lives in Asheville, NC where he indulges in the city's greatest commodity...BEER. Growing up in the DC area, there were always copies of the Washington Post piled around the house, so I've been a big fan of Richard Thompson's brilliant illustrations for many years. 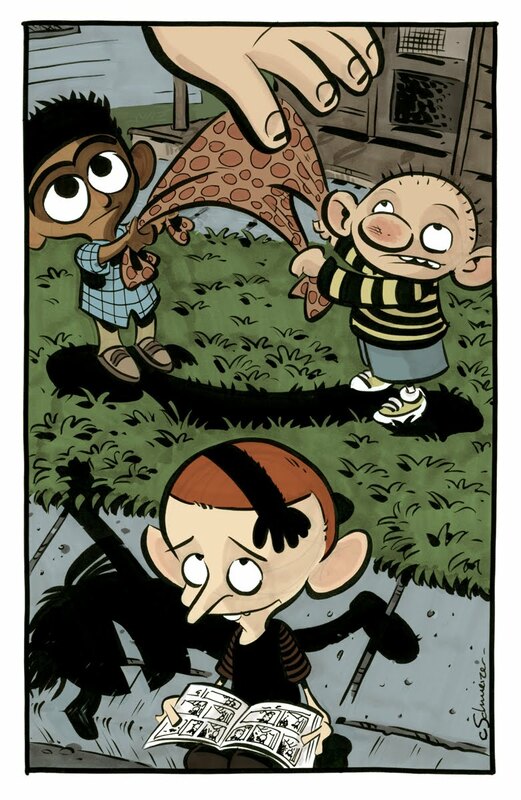 I recently heard Richard and some of his friends are starting a project called Team Cul de Sac where they're collecting original comics art to be auctioned off for the benefit of Parkinson's disease research. I just started doing my first official comic strip last week, so I feel pretty silly submitting a piece of my own work, but at least I have an excuse to send Richard this cartoon as a simple way of saying thanks for all of his great work over the years. Best wishes to Richard, his family, and everyone involved with Team Cul de Sac. Team Cul de Sac deadline has been extended! We have extended the deadline until June 17th! we did this for a couple of reasons. 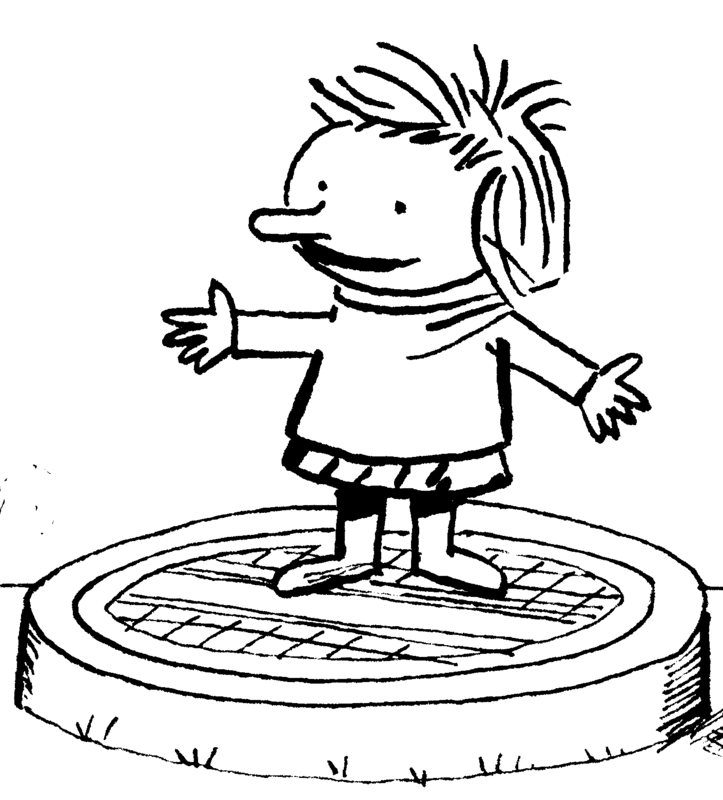 Lee Salem, Caty Neis, Richard Thompson and Chris Sparks ( thats me folks) will all be at the Reuben awards in less than three weeks. 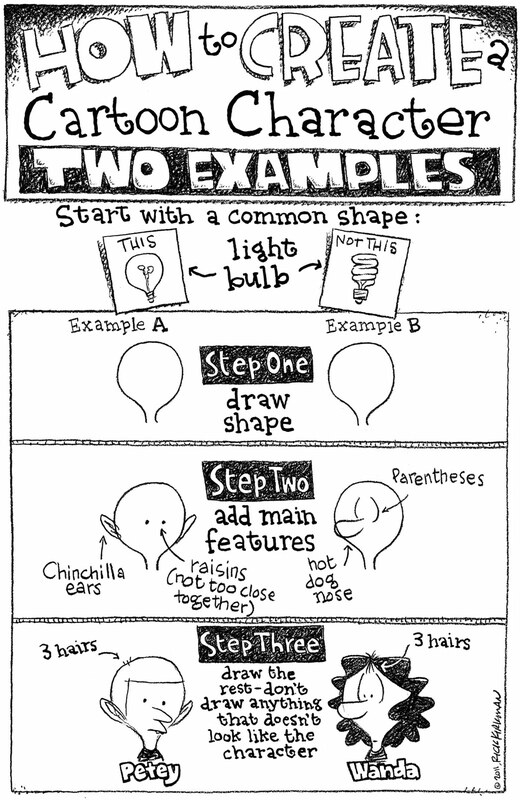 I will personally be asking cartoonist to contribute to Team Cul de Sac. Richard will be juggling, Caty might be Singing. It's going to be a great circus show for all ages.. I can't wait to meet everyone who has contributed so far! The following weekend please visit heroescon in Charlotte NC. Team Cul de Sac will be releasing The Fanzine for the ages! Craig Fischer is putting all of this together for us. This is just an amazing con. I have been going since 1994 and hope to continue till 2194. Shelton Drum is not only the best at putting on a great show but also always helping whenever he can. Thanks Shelton! We should have a table close to The one and only Richard Thompson. Please come buy and say hi to Craig, Mike Rhode , Richard and myself. Buy our fanzine, donate money to Team Cul de Sac, or heck buy us food a drinks! I just want to say thank you to everyone who is helping us. If you haven't yet....get busy! Paul is another wonderful supporter of TCDS. Here is what he had to say about Richard. deadlines, cartooning had become my job. The moment I saw Richard's work, I was back on the living room carpet again. He's the reason cartoonists cartoon. Thanks for that, Richard. 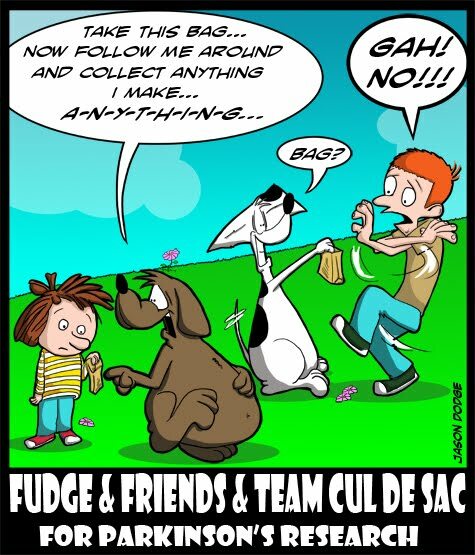 John Thank you for submitting the great art to Team Cul de Sac! 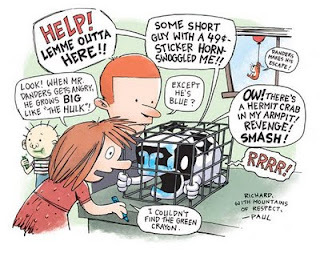 “One of the best things about being a cartoonist is knowing people like Richard. His personality and wicked sense of humor never fail to put a smile on my face. submitting samples to King Features Syndicate for development consideration. Things are really in high gear here at Team Cul de Sac headquarters. The packages are rolling in, faster than I can get them scanned and saved! Thanks to all of you who have contributed artwork and sent it off. 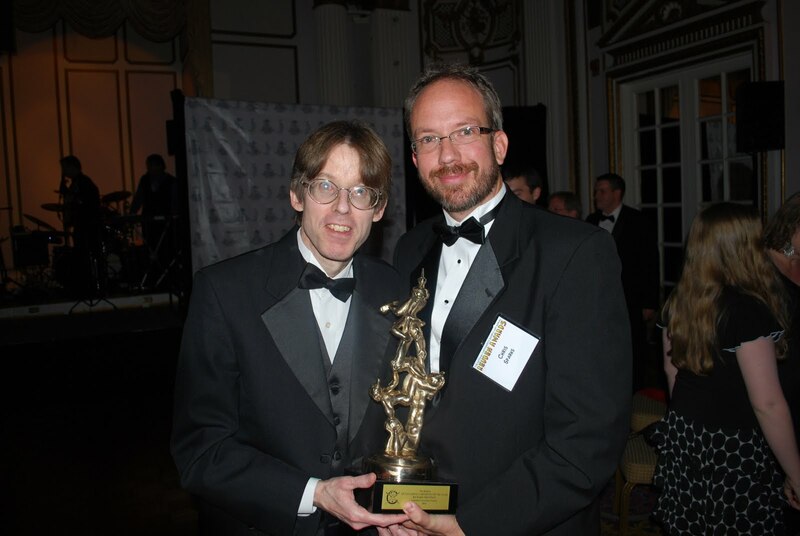 As you probably know, we have extended the deadline to squeeze in the Reuben awards. I would like to take a minute to thank one of the all time favorite comic strip creators, Rick Kirkman, for his LOL contribution. Class act. Susan Camilleri Konar sent this to us. She is someone else who has been touched by Richard and his charming personality. Below is a few words from her about Richard,followed by her bio. Enjoy! “I have only met Richard once, however, I've been fortunate to communicate with him via email several times (it's often me asking him annoying questions). I can only say that his warm, generous personality made me feel like I was an old friend. When I found out about Team Cul de Sac I couldn't wait to bring his cartoon world together with mine. It's a simple contribution to a great project. Richard, I wish you all the best and can only say you are one class act. Barbara Dale is just awesome! shows and has work represented in numerous private and museum collections. Barbara is currently writing a novel. Chris Schechner and Who is under your bed? Chris Schechner called me today and made my day. Thank you Chris. I always love to get emails, FB messages, and phone calls from people who are contributing. If they would just pick me up and buy me drinks! One can only dream. Please read his Bio. I hope you enjoy it as much as I did! Richard, for providing this platform. Here is what Jay said about our family. Thank you Jay. We are family, thank you for sharing. 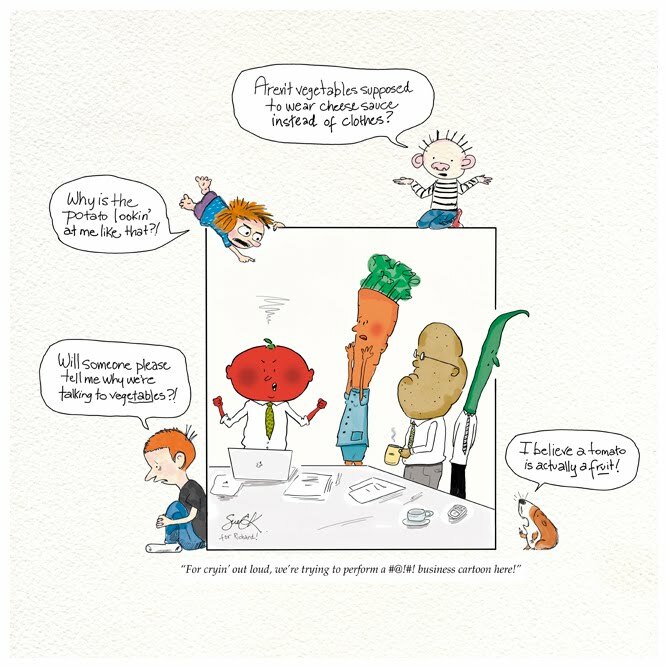 "Cartoonists are a tight-knit bunch. A couple of years ago I spent 8 weeks in hospital recuperating from the rather nasty side effects of debilitating mental illness. As part of the ongoing treatment, my doctor recommended openly discussing my clinical depression with others, which I did, and continue to do. As expected, the diagnosis scared off many friends and family, some of whom abandoned me to my fate. By a wide margin, those in the cartooning profession extended the most heartfelt sympathies, the kindest words of support, and extended the warmest hands of friendship. I felt so encouraged by that unconditional support, and will never forget it. 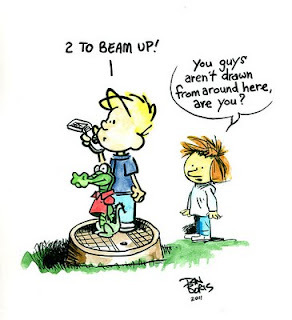 Cartoonists let me know in no uncertain terms that they are Family. Richard Thompson is my Brother. This is for him." Jonathan Lemon who does Rabbits Against Magic (a U|U feature) sent is this! 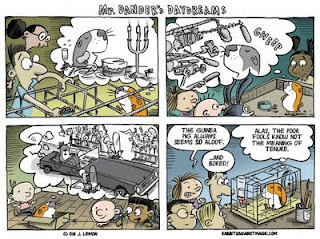 Everyone loves Mr.Danders More on Mr lemon soon! Brian's earliest cartoon memories are of drawing James Bond-esque comics in second grade. 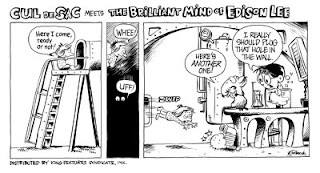 His cartoons appeared in monthly grammar school newsletters and then jumped to the St. John's High School Paper (where he promptly found himself in the Principal's office to explain the meaning of a giant soap-on-rope that had crushed a small sedan). Brian sent his college strip to the Syndicates in 1998. Although there was interest in developing the feature, Brian knew this wasn't THEE strip for him. For the next few years Brian spread his focus on his dark comic book visions and fledgling screenwriting career. "Harbor Moon", a graphic novel based on one of Brian's screenplay's was released in March. And his next picture book, "The Prince's New Pet" will hit shelves this fall. Terri Libenson of “The Pajama Diaries” just sent this to us! Having a two year old, I can relate and be scared! Thank you so much Terri! Please check out “The Pajama Diaries" link below! Terri Libenson is the cartoonist of the syndicated comic strip, “The Pajama Diaries,” which details the personal life of Jill Kaplan, a contemporary working mom trying to juggle it all. Terri is also a long-time humorous card writer for American Greetings Corp.
Terri graduated from Washington University in St. Louis in 1992 with a BFA in illustration. 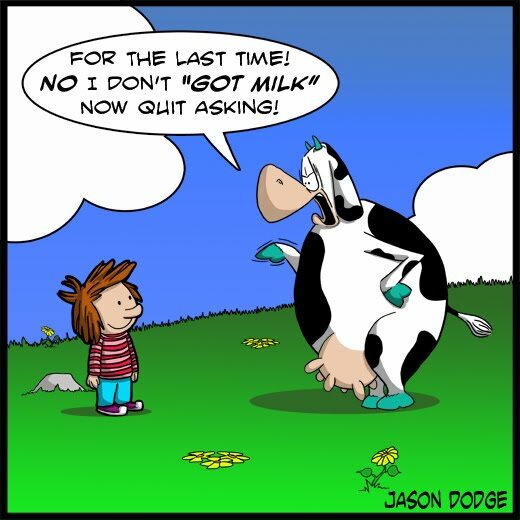 She developed her first professional comic strip, “Got a Life,” in 2000, which was distributed by King Features Weekly service. 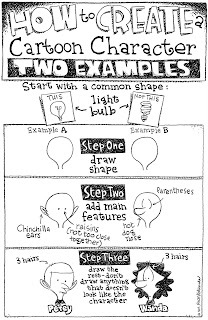 “The Pajama Diaries” was launched with King in 2006 and runs in newspapers nationally and overseas. Currently, Terri lives with her husband and two daughters in Cleveland, OH. I met Roger last year at Heroescon. He is such a sweet and wonderful guy. Roger is one of the most talented people in comics. I am thrilled he is part of Team Cul de Sac. 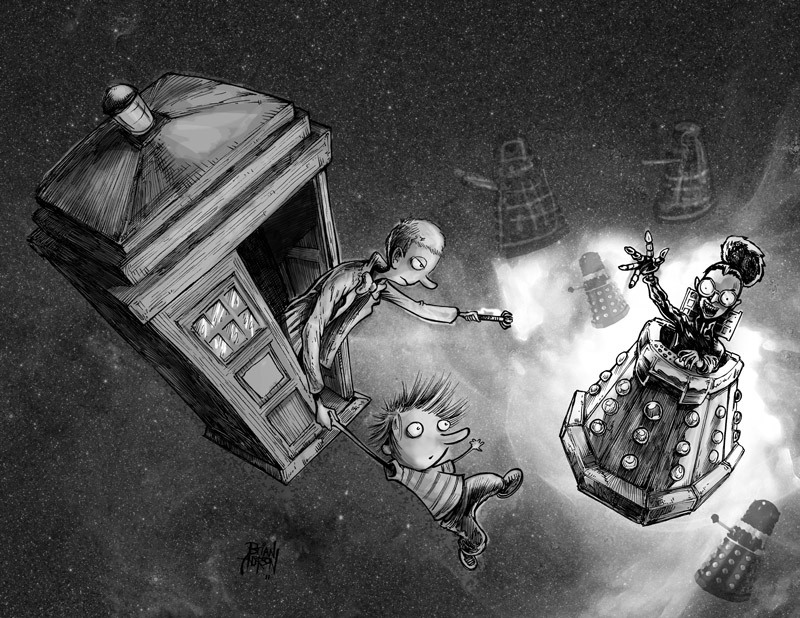 "Roger Langridge has been producing comics for over twenty years. Most recently, he has attracted critical attention for his work on the Harvey Award-winningMuppet Show Comic Book (Boom! Studios) and Thor: The Mighty Avenger (Marvel Comics); other works of note include Marvel's Fin Fang Four, Fantagraphics'Zoot! and Art d'Ecco (in collaboration with his brother Andrew), and his self-published comic book and web strip Fred the Clown. He is currently working on a new series, Snarked!, for Boom! Studios." 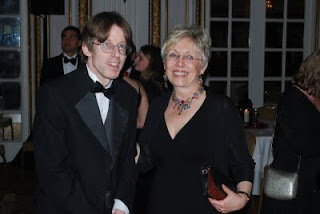 "As for Richard: I've been fortunate enough to meet Richard Thompson on a few occasions at comic conventions and to have a chance to talk to him over a drink or a meal. I love the way his wit works - he can be talking about something apparently seriously, then, with great comic understatement, he'll just slip in a zinger in the most casual way, to devastating effect, as if it were the most effortless thing - as if he himself didn't even notice it. His comics work the same way. He is also one of those great rarities, somebody who doesn't open his mouth unless he has something interesting to say. 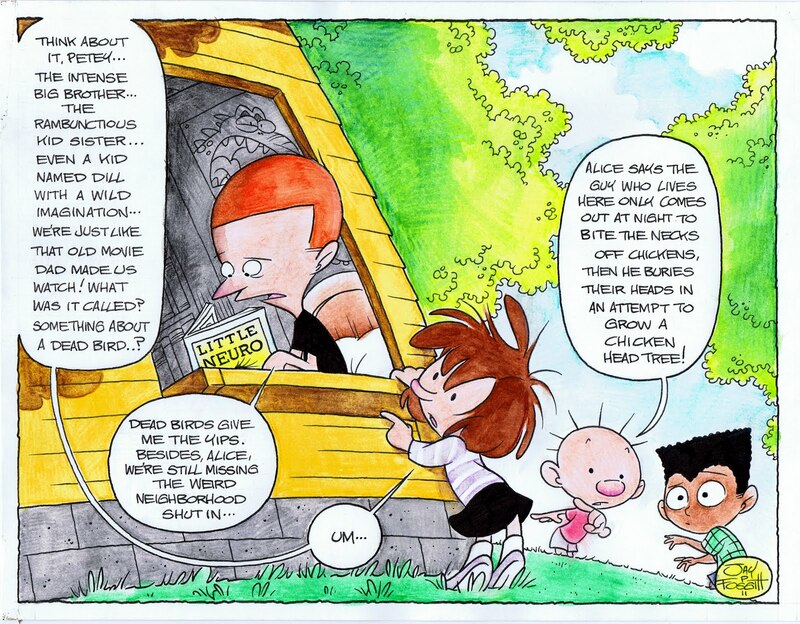 Fortunately, Richard Thompson has a lot of interesting things to say!"